RIL slips in the BT 500 ranking on lower gas output and falling oil prices but it could benefit from a likely gas price hike and earnings from new ventures such as retail. On May 16, when the Narendra Modi-led Bharatiya Janata Party won a majority in the general election, Dalal Street, riding on great expectations, propelled the shares of Reliance Industries (RIL) to a 52-week high of Rs 1,142.55. On that day stocks of most Gujarat-based companies had soared. But unlike many of these companies, the RIL stock could not hold its level for long. In the last four-and-a-half months, its stock has been one of the biggest underperformers among the BSE Sensex stocks. Between May 16 and September 30 it lost close to 12.5 per cent even as the Sensex gained 10.5 per cent. Reliance Industries, led by Chairman and Managing Director Mukesh Ambani, has made huge investments in its non-energy businesses such as telecom, retail, hospitality and media. 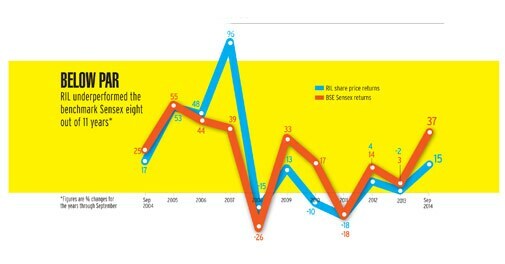 Since September 2003, RIL has lagged the Sensex eight times in 11 years. This has hurt its overall ranking in the BT 500 list. In 2011, RIL lost the top slot to Tata Consultancy Services (TCS) in the market capitalisation pecking order. It remained at No.2 for the past three years. This year, despite a 15 per cent gain in its market value (as on September 30), RIL slipped to the third position. The market value gap between TCS and RIL has further widened to Rs 1.36 lakh crore from Rs 51,643 crore in 2013. According to Rajesh Kothari, Managing Director of AlfAccurate Advisors, an investment advisory firm, underperformance of the exploration and production (E&P) business coupled with regulatory uncertainty has been the main reason for the dismal show of the RIL stock. "The market gave RIL a premium on expectation of the KG D6 gas discovery but it turned out to be a major disappointment. Thereafter, the RIL stock has been languishing," he says. Prayesh Jain, Associate Vice President of IIFL, a financial services company, says that, with growth being a concern, investors kept away from RIL. "The subdued stock performance is due to flat earnings growth in the last three years," he says. For 2013/14, RIL's Panna, Mukta and Tapti (PMT) fields produced 93 billion cubic feet (BCF) of gas against 145 BCF in 2011/12. But gas production from the KG Basin has plunged to 14 million metric standard cubic metre a day (MMSCMD) in 2013/14 from 43 MMSCMD in 2011/12. The price of gas produced from the KG Basin remains at $4.2 per million metric British thermal unit (MMBTU) despite RIL's demands for a higher price. Lower energy price has affected RIL's shale gas business in the US. In the July-September quarter, operating profit from the US shale gas business dropped almost 17 per cent from a year earlier. This is prompting RIL to look at selling some of its shale assets. Manish Bhandari, Founder of Vallum Capital, a Mumbai-based equity investment advisory firm, says RIL is a Sensex heavyweight and that has salvaged its stock. This implies that a small movement in RIL stock could make a huge difference in the portfolio. He says that when he was managing a long-only fund at ING Mutual Fund that used to benchmark the index, he often had to hold RIL shares even though he was underweight on RIL. Bhandari also believes that a drop in crude oil prices will hurt RIL. In the past three months oil prices have fallen from $110 a barrel to $90 a barrel. "RIL buys the worst quality of crude and after refining sells the oil at a good price, which helps them make a good margin. It will not help when crude prices fall. Upcoming refineries in West Asia and China have also played a role in the underperformance," he says. Another reason for the poor show of RIL stocks, says Kothari, is the dismal Return on Capital Employed (RoCE). "In the last three years, its RoCE has fallen from 12 to eight per cent while the earnings per share (EPS) has shown tepid growth from Rs 68 to Rs 75," he says. But things are changing, says Kothari. "Huge investments have been made in emerging business and today the company is waiting for those investments to bear fruit," he said. RIL operates in four major segments - refinery and petrochemical (its biggest revenue earner), E&P, retail and telecom. In a departure from the past, when investments were made into E&P and retail, today the money is being pumped into telecom. Meanwhile, apart from the refinery and petrochemical business, RIL's retail business too has become profitable. But there are concerns that if the company goes on an expansion spree, then the retail business would burn cash and go back into the red. Also, it is hoped that the gas pricing issue will be sorted out soon. RIL sources, on condition of anonymity, say they expect a revision in gas prices anytime soon. This could be a huge boost to RIL as the market hasn't discounted a hike in gas prices in its share price. When contacted, RIL declined to make any forward looking statement and didn't participate in the story. On October 1, Satish Mishra of HDFC Securities brought out a 'buy' report on RIL. In it he says that while the price of PMT gas would remain at $5.6 to $5.7 per mmBtu, it may go up for the KG Basin gas from $4.2/mmBtu to $5.7 in 2014/15 and $7.2 the following year. Mishra also expects RIL's gross refining margin (GRM) to stabilise in coming years. In 2013/14, the GRM shrank to $8.1 a barrel from $9.2 the previous year. Mishra expects the GRM to hover around $8.5 a barrel in the next two years due to higher global incremental demand and a delay in new capacities. The petrochemical business is also expected to grow. By 2015/16, according to Mishra's report, RIL is likely to benefit from capacity addition in its polyester business. Its total impact is expected in 2017/18 when the company's operating profit is projected to jump by 78 per cent to Rs 55,000 crore from Rs 30,878 crore in 2013/14. However, a senior official of a domestic financial service firm that manages close to $2 billion funds, said, "Globally, energy prices are falling and importing makes sense. So prices will remain a concern for RIL." He pointed out that RIL is a mature business but "it is unable to generate alpha" [returns higher than a pre-selected benchmark]. "Like ITC, the core business of RIL will generate money but the problem is that unlike ITC where capital-to-output ratio is high, it is low for RIL. It implies that other businesses like retail and telecom will burn huge cash and won't generate desired money in the short run. So RIL will record a good top line but the bottom line will be a concern," he said. Further, he says companies that hold huge cash in hand often misallocate the money. "RIL is going through the same phase. When your peers have deep pockets then the last-man-standing concept doesn't work and this is a huge risk," he says, hinting at investments in telecom, retail, hotels and media. RIL holds an 18.5 per cent stake in EIH Ltd, the flagship company of The Oberoi Group. 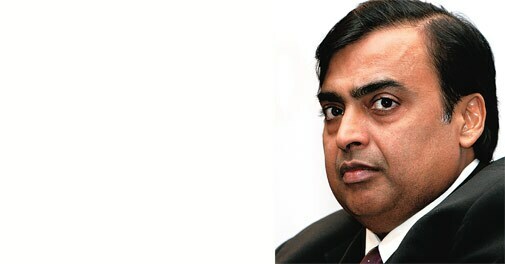 On the positive side is the fact that RIL is holding cash reserves of about Rs 88,000 crore. It made close to Rs 9,000 crore from treasury operations, which was 41 per cent of its total net profit of Rs 22,000 crore in 2013/14. 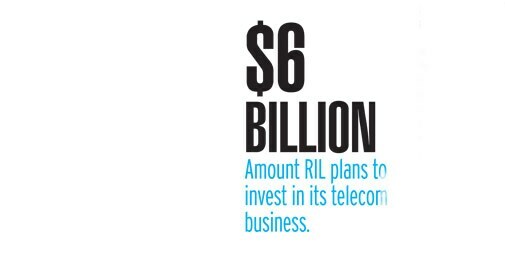 RIL has been diversifying and with an investment of $6 billion so far, telecom has been its biggest bet. It now plans to invest another $6 billion in the telecom business. This means that, following its expansion plans, RIL would have less cash in hand. 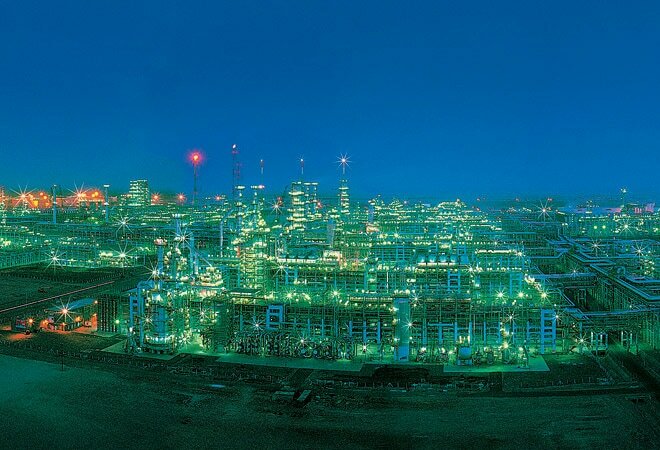 "Though there is going to be huge capex in the core petrochemical and refinery businesses in the next two years, the debt-to-equity ratio wont be more than 0.7 for RIL," says Jain of IIFL. Jain also said that telecom investment will add further burden on the balance sheet. Growing investment in telecom is being seen by analysts as a big negative for RIL as it is difficult to ascertain return on investments in the sector. While the telecom spectrum auction is due in the next six months, it is anybody's guess as to how ugly the tariff war will turn out to be or how much money can be made on data. Though risks abound, Kothari, whose fund portfolio since 2009 includes two to three per cent of RIL stock, is optimistic. "RIL is on the verge of an inflection point. Most negatives have been discounted in the share price," he says. "The company has all ingredients to make it big. With strong financial management and business acumen, it is only a matter of time when RIL starts delivering. One has to remain patient."